I participated in the Article 9 Peace Walk on the afternoon of March 26,2008, from Zennenji Temple in Otsu to the Kusatsu City Hall in Shiga Prefecture. The Walk had started in Hiroshima on February 24th, and it was the 32nd day of the 71-day of walking tour to Makuhari, Chiba, where the Global Article 9 to Abolish War will be held on May 4th and 5th. This Walk is an official 'pre-event' of the international conference which expects participation of 7,000 or more citizens from around the world. The Article 9 Peace Walk has about 10 people who have started in Hiroshima and plan to walk all the way through Makuhari, including Ven. Kato, Sr. Claire and other priests of Nihonzan Myohoji, rap singers The Foundation Movement, and Ash Woolson, a Iraq veteran and President of Chapter 32 (Bellingham, Washington) of IVAW(Iraqi Veterans Against the War). The size of the group varies from 20+ to 200+ depending on where they go, with people coming and going at each place of call. On the day I joined the group, there seemed to be about 50 people having lunch, but somehow in the group photo there seems only to be around 25... maybe each person had the energy worth of two people! at Kusatsu City Hall where the city employees welcomed us and a rep of the Mayor gave us a message. Ven. Kato invited me to give a speech so I introduced VancouverSave Article 9 (VSA9) and its involvement with the Global Article 9 Conference. VSA9, together with other Article 9 organizations outside of Japan including one in Switzerland, will organize a session during the Conference, which will be about how to support the Article 9 movement from outside of Japan and how to encourage other governments to adopt an Article 9 - like clause in their constitutions. If you are going to be in Japan between now and early May, and/or if you have friends living in the areas between Shiga and Tokyo, I highly recommend participating in this Article 9 Peace Walk that will be your great opportunity to make friends with Japanese and international participants, receive wonderful hospitality in each area you visit, get to know police people in different areas whether you like it or not, shed a few pounds around your waist, get some good tan and above all, you get a real feel of living and walking the Preamble and Article 9 of the Peace Constitution. After all it is all about having fun, making people-to-people connections, sharing food and conversation, and feeling the Earth underneath your feet! Here is what Ash Woolson wrote in Osaka about his experience, which I thought so well spoke to the essence of the Walk. Here is the link to more photos. Thank you for such a memorable afternoon. My heart will be with the walkers all the way to Makuhari. Yesterday morning (March 24), Kimiko Nezu and Junko Kawarai, sat through the singing of Kimigayo at the graduation ceremony at their schools, as they have always determined to do so. As expected, they were both interrogated by the education board authorities, then held a press conference in the Tokyo Metropolitan Government Building No.1. They argued for an hour, and both sides were very careful not to touch each other or engage in any physical activity that could be interpreted by the other party as an act of violence. Then Nezu, Kawarai's party went downstairs and demonstrated in front of the Met. Gov. Building, as they have been doing almost every day of this month. 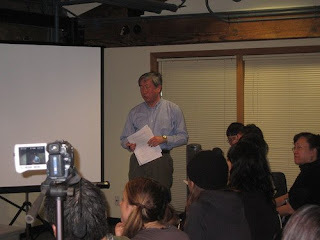 Nezu invited me to speak so I spoke of the Canadian citizens' support, especially that from B.C. teachers. I read the Resolution 202 by BCTF, one that supports Japanese teachers under punishment. Nezu is likely to receive a notice of dismissal on March 28, which, if it happens, will come into effect on March 31st. If this does not happen, it will be a victorious event for her and their supporters. It it happens, it will be the first dismissal of a teacher in Japan for not standing up for Kimigayo. In a country that is supposed to be free and democratic, a teacher is about to be fired for sitting for 40 seconds. Scroll down to March 24th. Photos from yesterday and scanned copy of the BCTF resolution are uploaded on the supporters' blog, much of which have been translated by a group of volunteers based in Vancouver. Thanks to Kimiko Nezu, Junko Kawarai and their wonderful supporters for allowing me to be part of this special day. Today, there is a movement by some politicians to amend the constitution to make a Japanese army. If they were to amend it, they should form a new constitution which declares more clearly we do not have military power. Surely, a military gives each country power in international politics. To think about this from some politicians’ perspective, it may seem unacceptable that Japan has fallen behind other developed countries due to not having an army. For example, Japan couldn’t send defense forces to the Iraq war smoothly. As a result, it was blamed by other countries. When war happens, the people who actually go to battlefield, who actually bleed, are civilians, like us. Nobody living should want to kill anyone or be killed by anyone. It is natural that everyone wants peaceful happiness. I believe this is a simple and clear truth. But, as previously mentioned, that it is politically advantageous to have military power is a truth, too. Now, the United States, which leads all developed countries, is fighting. And, military power, including nuclear weapons, can be used as a political card, such as North Korea does. Thus, two conflicting truths exist in the world. What can we do based on this situation? The answer is that we Japanese should take the lead and send Article 9 of the Japanese constitution all over the world. Japan has experienced being an assailant and a victim by big past wars. And, now we Japanese lead a peaceful life where we don’t have to think, “I may die tomorrow.” We gained the “Peace Constitution” and this life through past big experiences. As such, we should send Article 9 of the Japanese constitution all over the world. My idea may be childish and idealistic, but I hope that Article 9 of the Japanese constitution will guide the world to peace. This is a report by Yoo, Jinwoo in Korean of the peace education event on March 8, 2008 with guest speaker Misako Iwashita. 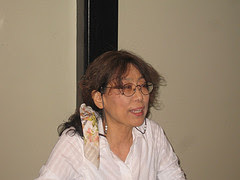 A Japanese translation by Yuri Kimura follows. 저는 지난 3월8일 라운드하우스 커뮤니티 센터에서 역사 선생님이자 오사카 평화활동가인이와시타 미사코 선생님께서 “관찰자가 아닌 역사의 참여자”라는 주제의 강연에참여하였습니다. 미사코 선생님께서는 과거 전쟁 중 일본의 역사교육과 현재 일본의 역사교육 실태에 대한 설명을 하셨고 또한 역사 선생님으로써 역사 공부에 능동적으로 참여하는 것이 다가올 미래의 평화를 유지하는데 중요한 부분임을 말씀하셨습니다.다양한 국적의 40명이 넘은 참석자들이 이번 강연에 주의 깊게 경청을 하였고과거 일본침략의 피해국가중에 하나였던 한국인으로써 이번 선생님의 강연은 현재 일본정부가 계속 부인하고 있는 과거 역사에 대한 잘못된 부분에 대한 올바른 관점을일본 학생들에게 올바로 전해주려고 하는 노력에 많은 감명을 받았습니다.하지만 이런 역사교육이 과거 일본 저지른 잘못된 행위에 대한 사실을 알려주는교육에 그치는 것이 아니라 더 나아가 그 잘못된 전쟁으로 인해 많은 슬픔과 피해를 입은 주변국들의 아픔의 역사를 피해자적 관점으로써의 교육 또한 필요하다고 생각됩니다.이런 교육은 일본 학생뿐만 아니라 피해를 입었던 주변국의 학생에게도 반드시 필요한역사 교육이라고 생각됩니다. 이런 노력들이 계속된다면 서로에게 진정한 의미의미래로 함께 가는 평화적 동반자가 될 수 있을 것이라 여겨집니다.이와시타 마사코 선생님의 노력에 진심으로 감사 드리고, 이런 노력들이 평화로 가는 큰 결실로 반드시 맺어지길 기원합니다. 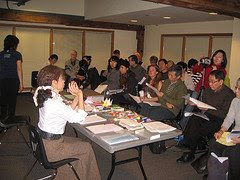 On March 8th, Misako Iwashita, a history teacher and a peace activist from Osaka, gave a talk under the topic of “Not an Observer, But a Participant of History” at the Roundhouse Community Centre. Ms. Misako reviewed the war-time education and the current situation in Japanese history education. As a history teacher, Misako sensei reminded her audience that people should activiely participate in the studying of history, which is important to the making of a peace of future. Over 40 people, with various backgroud, attended this meeting. MS Teklla Lit, the president of BC Alpha attended this meeting and gave an inspiring feed back in response to Misako’s talking. This is a report of this event for Chinese readers. On March 5th, I met the people who are putting on the play The Face of Jizo on March 21. The Face of Jizo is the English translation (by RogerPulvers) of Hisashi Inoue's play "Chichi To Kuraseba(Living with MyFather)." It is a play about a young woman and her father who suffered the atomc-bombing of Hiroshima, on August 6th, 1945. I previously posted information about this production both in English and in Japanese. This student-led production in Victoria will be, in my understanding,the first full production of the play in North America, after the public reading events in Toronto and Vancouver. Ayumi Hamada,originally from Kochi, Japan, who will play the lead role Mitsue, is a student of UVic (University of Victoria) majoring in theatre. Alyssa Knox, the Director, studies English Literature and Aya Walraven, assistant for Ayumi(what she Aya calls "a-little-bit-of-everything" role),studies Visual Arts also at UVic. I was curious what these young Canadians thought of the play. Alyssa said that many Canadians learn about Sadako and Thousand Paper Cranes at school but that is about it;few actually know the real emotions of the victims, like those expressed in the play. Concurrent with the play, Vancouver Save Article 9 will display panels of "A-Bomb and Humanity" outside of the theatre. These panels were donated by Hidankyo, a national organization of A-Bomb sufferers in Japan. This is why I went to Victoria this time, to deliver those panels and to meet with Ayumi and her colleagues. 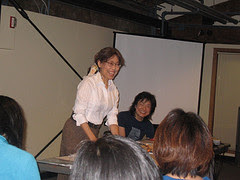 Yoko Freer and Yukiko Nonaka, members of Vancouver Save Article 9, kindly hosted the meeting. Yukiko is one of the committee members, and she has always wanted to start an Article 9 group in Victoria, knowing how active the Vancouver group is. This play will be a great place to start spreading the word out and getting a group together. If you are in Victoria and would like to be part of the new movement, please contact me atmailto:atinfo@peacephilosophy.com. Also at the meeting were Yukari Peerless, a study-abroad agent based inVictoria, and Yasushi Arato, an international business person in the health-food industry, who are helping Ayumi with promotion and the set-up of panels on the day of performance. In the picture above, from left to right at the back, are Yukiko, Yoko, Aya, Alyssa, Yukari, Yasushi, and in front, Ayumi (centre), and myself. Pacifism is one of the most important principles of the Constitution of Japan, which is supported by Article 9. Although, there are many countries that tout pacifism around the world, Article 9 is unique to Japan in terms of the abandonment of any kind of war including self-defense. However, in recent years, the Japanese Government tends to erode the decisiveness of Article 9. In the year 1999, the bill that bring Guidelines for Japan-U.S. Defense Cooperation into force become law. According the new law, if a crisis happens near Japan, not only the Self-Defense Forces of Japan and government offices, but also municipalities and private hands have to contribute to the US Amy. Although the state primarily shoulders responsibility to protect ordinary people, this law makes it possible to mobilize the population in part of the US Army and threaten their ordinary life. Moreover, the Japanese Government is considering changing Article 9 itself. It is true that Japan is protected by the US and there is some contradiction between Article 9 and the status quo, however revision of Article 9 is not the appropriate way to put an end to these problems. The most important thing is to save this unique pacifism of Japan for both its citizen and the world. Since the wars led by the US Army in Iraq and Afghanistan show that war is not successful way to achieve peace, Japan should not follow the US any more in terms of military affairs. Rather, Japan should defend Article 9 and its unique pacifism, and contribute to spread peace in different way. What Japan should do is not to think about changing Article 9 but about various means to achieve peace in the world apart from military forces. Here is another essay on Ariticle 9 by Sungsook Lim, a UBC PhD student anthropology. One perspective in regards to revision of Article 9 of the Japanese 1947 constitution is that it should not be altered under any circumstances. This is supported by both the economic success Japan has achieved since losing World War II despite a lack of offensive military forces and the inevitable criticism Japan would receive both domestically and from regional neighbours, some of whom experienced Imperial Japan’s brutality firsthand in the past. Japan, however, must take both regional and global threats into account. Terrorism, the rise of China, and nuclear threats from belligerent countries like the DPRK are all threats that may be counter argued as concerns ‘taken care’ of by Japan’s heavy and long standing reliance on the United States for protection through its longstanding security alliance (which has eliminated Japan’s need for maintaining offensive capabilities thus so far), however the US’s pressure on Japan to rearm and become more self-reliant, has been continuous since the post-WWII occupation period. Since the controversial creation of the SDF in 1954, Japan’s military has expanded constantly, bringing Japan to presently sit in the top 5 military-spending countries in the world. Should something disrupt the US-Japan alliance, Japan would in all likelihood be forced to add offensive capabilities to its defensive ones to protect itself and its interests around the world. Japan should not revise its Article 9, however. Indeed, Japan currently enjoys a state of peace and relative cooperation with both regional neighbors and most countries around the world, in which strong trade links exist. As well, the Empire of Japan days during which the nation was urgent to catch up with the west, are over; Japan has surpassed its goals in this regard, having become the world’s second largest economic power. Imperial Japan is simply not the Japan of today, and it is very unlikely Japan would act as the aggressor that it did in the past given today’s modern context.